Once your baby starts crawling, there’s no doubt that they will make it an adventure to explore every corner of the house. While it’s always fun for a baby to explore, there are some places that are just plain not safe. Here are 10 simple ways to make your home baby-proof. 1) Electrical outlets – There is something about electrical outlets that fascinates babies. Unless you refuse to use electricity, this needs some attention. These are great for making electrical outlets baby-proof. Keep in mind though, older outlets tend to be looser and such plugs won’t stay in securely. If this is the case, make sure your baby doesn’t get near them. 2) Sharp corners – You definitely don’t want your baby falling on these, especially if he or she is still learning to balance their weight while crawling or sitting. The best way to care of this is to simply cover them up! There are plenty of options to do this. 3) Clean up! – How many times do you find small objects on the floor after cleaning up a room full of toys? It’s helpful to keep a baby’s area clean, especially if there are toddlers in the same playing space. Everyone knows how much toddlers love a room full of toys! 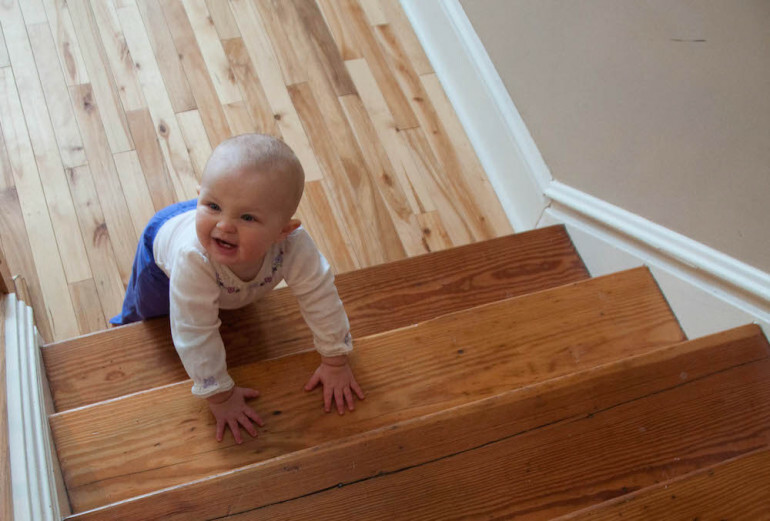 4) Gates – Did I mention that babies love to climb stairs once they learn to crawl? Okay well, babies LOVE climbing stairs! The problem is they don’t know the consequence of falling backwards. That’s why it’s important to keep those stairs blocked! Even if you don’t have a gate handy, you can use other objects to block the stairs. It’s better to be safe than sorry. 5) Play with them! – What better way to keep your baby safe than keeping your eye on them? While we can’t all be playing with kids all day, it’s worth mentioning that babies are always safe when under proper supervision.